New content debuts diverse collective of people brought together by Converse who are driving and redefining youth culture. BOSTON, MASS. (MARCH 9, 2017) – Rooted in youth culture, Chuck Taylor has been and will continue to be, an ever-lasting symbol — never a trend. Chuck is 100-years old, and still brand new. 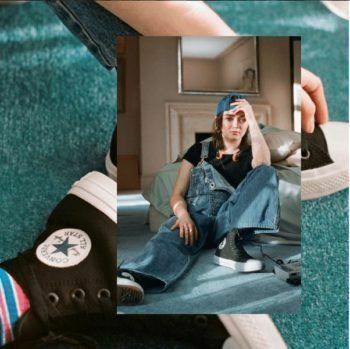 To bring the street style icon to today’s generation, the “Forever Chuck” campaign launched this past February as the first global initiative to serve the encapsulating spirit of youth. Taking over social media feeds, retail displays and digital commerce with engaging stylized images, the videos (Chucks, from the Runway to the Streets, Chucks and LA Culture and Why Iconic Characters Wear Chucks) all told stories of Chuck’s rich history and bright future as a cultural mainstay. View our full Converse collections here. Today, Converse officially debuts the most pinnacle piece to the story of Chuck. The “Forever Chuck” film is the crescendo of the campaign, an homage to a new generation defining culture and style. In it, Director Karim Huu Do creates a visual collage of the dreams and desires that drive people who wear Chucks. The talent featured share Converse’s brand values and span a range of genres, appeal and notoriety and are collaborators who will focus on communicating compelling stories. Olly Alexander, Keith Ape, Millie Bobby Brown, Jordan Clarkson, Gucci Gang, Winnie Harlow, Lukas Ionesco, Last Night in Paris, Salem Mitchell, Sean Pablo, Marissa Seraphin, Yara Shahidi, Rejjie Snow, Vince Staples and Maisie Williams. Converse Inc., based in Boston, Massachusetts, is a wholly owned subsidiary of NIKE, Inc. Established in 1908, the Converse brand has built a reputation as “America’s Original Sports Company”™ and has been associated with a rich heritage of legendary shoes such as the Chuck Taylor® All Star® shoe, the Jack Purcell® shoe and the One Star® shoe. Today, Converse offers a diverse portfolio including lifestyle men’s, women’s and children’s footwear, apparel and accessories and is sold globally by retailers in over 160 countries.